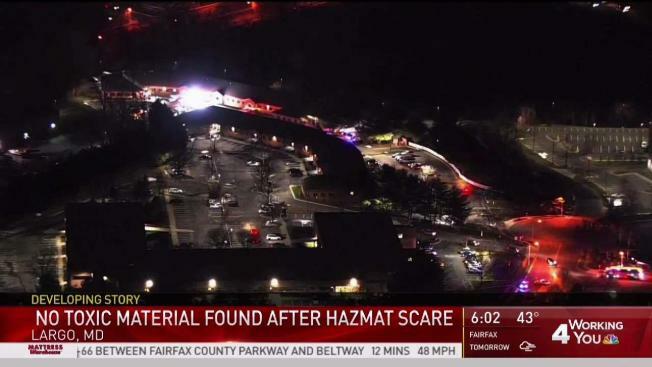 A hazardous materials team was called to a Maryland state senator's office in Largo after three people reported feeling sick and believed they may have inhaled something toxic. Prince George's Fire Department spokesperson Mark Brady said investigators didn't find any hazardous, suspicious or toxic substances. A woman who works at Senator C. Anthony Muse's campaign office reportedly took the bag out of a trash bin and felt "a sudden rush of something being inhaled," Brady said. Initial reports were that she saw a white powder waft into the air from the trash bin, but officials said no white powder was found. The woman felt sick when she returned from the dumpster. Fearing she had inhaled something toxic, she called 911. Two others in the office also felt sick. The affected people were reportedly coughing, but Brady said they were conscious, breathing and under evaluation at the scene. They were not taken to the hospital, Brady said. "Nothing has been found that appears suspicious," Brady said. Senator Muse, who is married to News4 anchor Pat Lawson Muse, was not at the office. He's in Annapolis. Several churches and businesses were evacuated as a precaution. The office at 1400 Mercantile Lane in Largo has workers and other people coming and going each day.